I am not known to be a gluten-free advocate. Fortunately, I don’t seem to have any extreme gluten allergies. Although I AM very aware of friends and family that have trouble with the stuff. My heart goes out to them. I just can’t imagine them not being able to enjoy the foods that they once did. Gluten can really mess some people up. After hearing a radio show segment about gluten-free cooking on NPR’s Fresh Air, I was inspired to make this dish. After listening (to what sounded like a foreign language to me) about all the different gluten-free flour combinations and gluten-free baking techniques, I learned that cornstarch and cornmeal are naturally gluten-free. Ya’ll know I don’t bake. Okay, I DO bake but I ALWAYS follow a recipe. If you didn’t know, baking is a science and ain’t nobody got time for that! So anyway, I was excited to try this gluten-free fried chicken idea. It didn’t seem hard and I already had the ingredients. Except for the waffles. I don’t have a waffle iron (hint hint J-Wiz). The ones in the pictures ARE store-bought and I have to admit, they weren’t half bad. This is what they look like. They come in blueberry as well and cost about $2.50. Not bad. Clean up you chicken breast by trimming the fat and rinsing off with water. Pat dry and salt and pepper each piece. Place in the refrigerator until ready to fry. In your largest skillet, heat oil on medium or medium high. The thicker the piece of chicken, you want to cook at a lower temperature for a longer amount of time. Place 1/2 cup of cornstarch in a medium bowl. Place the other 1/2 cup of cornstarch and 1/2 cup of cornmeal into another medium bowl, along with the onion, garlic, paprika and seasoned salt. In a third medium-sized bowl, pour in the evaporated milk. I like to use evaporated milk for fried chicken because it’s thick and it coats the chicken very well. Don’t forget to salt and pepper! I also add hot sauce but that is totally optional. First, you are going to coat each piece of chicken in the plain cornstarch. Next, dunk each piece of chicken in the evaporated milk. Finally coat each piece of chicken in the flour/cornstarch mixture. Place the pieces of chicken in the hot oil and fry for about 10 minutes on each side. They should be a nice golden brown and no longer pink on the inside. Place the fried chicken breasts on a paper towel to drain excess oil. 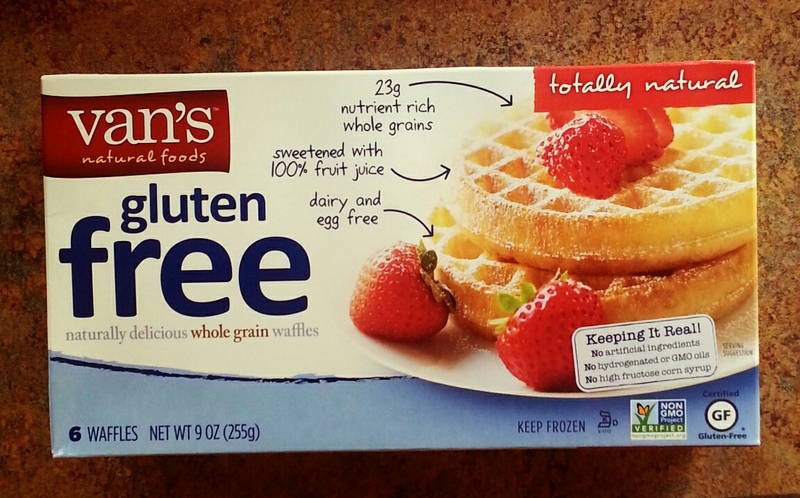 Enjoy with your favorite gluten-free waffles! We topped ours with good old fashion honey. Honey is naturally gluten-free as well as 100% maple syrup. When you get to the flavored pancake syrups, be careful. Some may contain gluten. 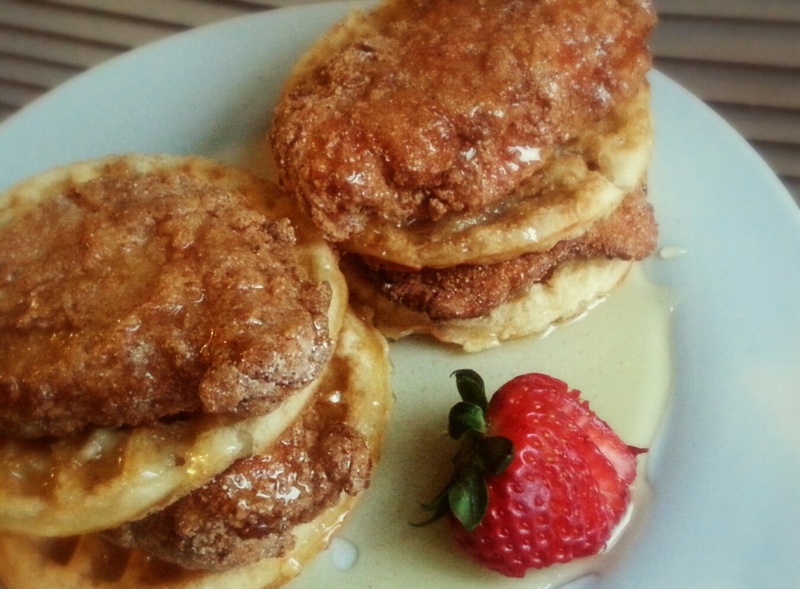 This entry was posted in Breakfast/Brunch, Dinner, Food, Gluten Free, Munchies, Recipes, Sweet Tooth and tagged chicken breast, cornmeal, cornstarch, fried chicken, Gluten Free, gluten free chicken, Gluten Free Fried Chicken, gluten free waffles, gluten-free cooking, honey, waffles. Bookmark the permalink.